Can you believe how fast time has flown by this year? I'm so excited for Halloween. I've been waiting for the dark and dreary days of fall pretty much all summer. If you want to celebrate the last bits of summer, do it in style. Flaunt the darkness with one of these sugar skull summer dresses. 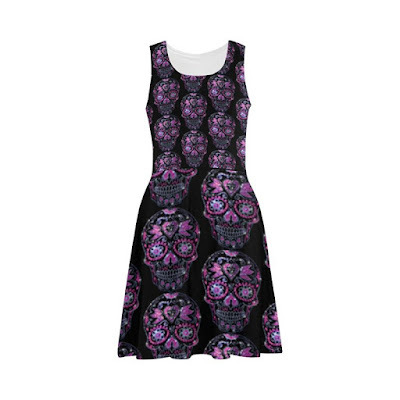 I wish I saw this purple sugar skull sleeveless dress earlier this year. The purple and pink colors are almost toxic looking. It would be fun to wear this to a nightclub so the skulls would glow in the UV lights! Of course the paisley skulls are very elegant. This is a very traditional art style for El Dia de los Muertos. This sugar skull flowers dress is kind of cute, but not my style. If it's still warm where you are at, you could wear this to the beach! 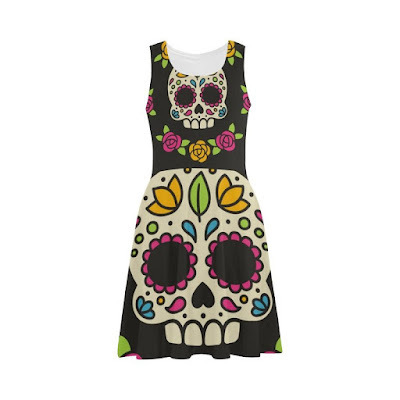 It's so cool how the skulls overlap each other on this flower sugar skull sundress. I could definitely see myself wearing this to one of my final summer parties. What about you? I really like this sugar skull summer dress! But I hate the fact that it says "sugar skull" on the dress itself. It's incredibly distracting from the pastel skulls. This is quite a fiesta! 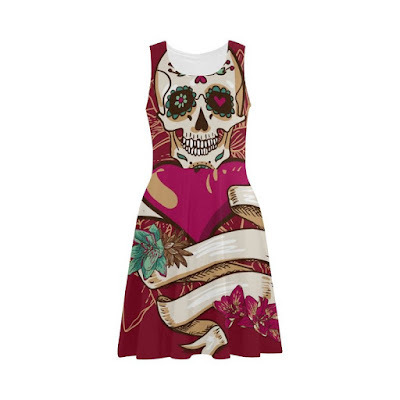 I don't think I could get away with wearing this colorful sugar skull sleeveless dress. I think I would have rather had the skulls look spooky than cute. 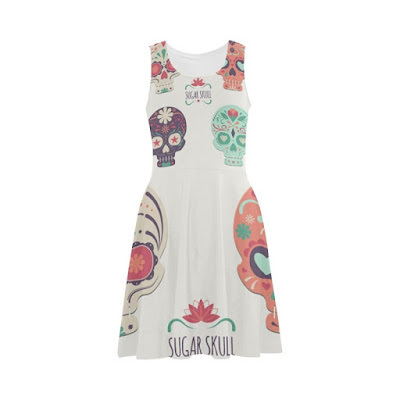 If you're really into skulls and tattoos I would check out this sugar skull summer sleeveless dress. It looks like a design you would use for your next sleeve. The skull is a little creepy since it's kind of grinning at you. On this dress, instead of skulls we have a zombie girl! This Dia De Los Muertos sundress dress is elegant and sinister at the same time. It's so strange that the undead can also be so beautiful. 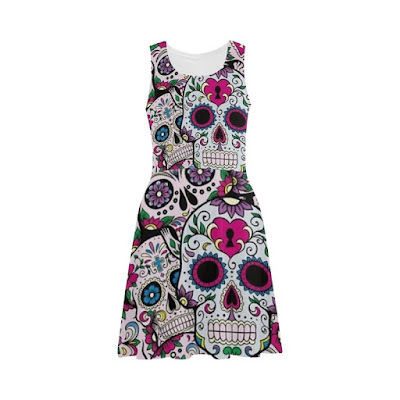 Get the last bits of summer in with these sugar skull summer dresses. Which one do you like the most? Make sure to comment below and tell me your thoughts!